Sunday’s Moto2 season finale was just one of those races. Polesitter Luca Marini got tangled up with two MotoGP promotees, Pecco Bagnaia and Joan Mir, and just like that three of the day’s strongest favorites were scootering back to their garages, their day and bike trashed but their futures as bright as ever. With those three out of the way, Miguel Oliveira caressed his KTM to an easy win, having already lost the War of 2018 to Bagnaia. The weather sucked. The 97,000 fans saw a lot of crashes all day and got soaked for their trouble. If they arrived in time to watch the earlier Moto3 race they saw history being made—more on that later. Otherwise, it was a high-side festival in the wet with 29 seconds between first and fourth positions. A demolition parade, if you will. Very un-Moto2-ish. Alex Marquez, the struggling Estella Galicia rider, younger brother of The King, won the Moto3 championship in 2014 and looked to be, as rumored, at least as fast as Marc. He has since spent the last four seasons underperforming in Moto2. He has made a career, at this point, of crashing out of contention, and is the main reason his team went winless in 2018 for the first time since The Armistice. So the last race of the Honda era of Moto2 was a bummer for pretty much everyone but Oliveira and KTM. The records have been set, the memories burned in, and a new era begins next week as the Triumph 765cc three-cylinder monsters take their place, a whole new ball game commencing in 2019. The four graduates into MotoGP—Bagnaia (Pramac Ducati), Oliveira (Tech 3 KTM), Mir (Suzuki Ecstar) and Quartararo (Petronas Yamaha) will move on up the food chain, leaving as Moto2 favorites guys with names like Brad Binder, Lorenzo Baldassarri, Luca Marini and Xavi Vierge to slug it out for the championship. They will be joined by Moto3 fast movers Jorge Martin and Marco Bezzecchi, presumably keeping Moto2 (and the Red Bull Rookies Cup) healthy and thriving. The racing is, on occasion, astonishing. We will keep you posted on happenings in Moto2 during testing and the off-season. It’s about time. MotoGP is the fastest-growing motorsports flavor on earth. That it has virtually no presence or accessibility in the US is a poor joke. It appears the safety-conscious American parents of today are (understandably) reluctant to let their kids, most of them, anyway, learn to ride ATVs and motorbikes when they’re young. Series organizer Dorna has recognized that a country wishing to develop world-class riders needs to have a formal development program, one of which was implemented in Great Britain just this year. (Probably because of Cal Crutchlow, The Great English-As-A-First-Language Hope.) Such leagues have existed in Spain and Italy for decades. The fact is that the US, for its size, with expensive national marketing costs, doesn’t sell a lot of imported motorcycles, and it’s doubtful that showing more MotoGP races would change that. So most of us Americans miss out. Meanwhile the Aussies and Kiwis are all over this stuff, along with Europe and much of Asia. No more giving up calendar dates in favor of F-1; MotoGP has MoMentum. No more five weeks off in the middle of the summer, either. Countries from Thailand and Indonesia to Hungary and Finland are clamoring to host races; pressure on the calendar, with four rounds still in Spain (quietly drumming my fingertips on the tabletop), is intense. Even money says the calendar goes to 20 dates within five years. And get rid of Aragon. Or Argentina. Overall, 2017 has the look of a great season. The Big Three factory teams of Yamaha, Honda and Ducati will dominate much of the action, as they are home to the Aliens, those riders whose balance and instincts are a step above the rest of the field—Marc Marquez, Valentino Rossi, Jorge Lorenzo and new Alien on the block Maverick Vinales. Keeping them honest will be the likes of Lorenzo’s teammate and wingman Andrea Dovizioso, Cal Crutchlow on the LCR Honda, and Andrea Iannone on the factory Suzuki. Alex Rins, on the second factory Suzuki, and Johann Zarco on a Tech 3 satellite Yamaha are the Moto2 grads most likely to podium this year, with Rins looking, to me anyway, like the rookie of the year for 2017. Another Alien in the making. Let’s just look at this thing team by team, in alphabetical order. We will wait until after the season opener to assign tranches to the various riders. Sam and Aleix need to be prepared for a long season. 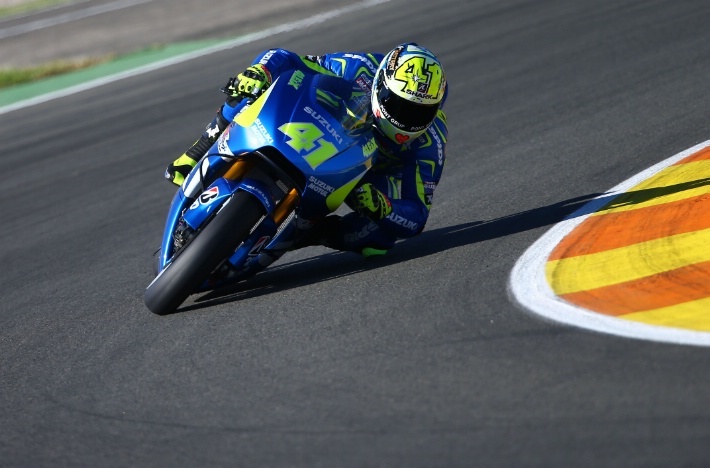 Hard luck Espargaro, having lost out to Iannone and Rins at Suzuki, takes a step down joining the Aprilia factory effort, on the upswing but still learning their way around. The Aprilia and KTM projects are likely to be relatively underfunded for the foreseeable future, slowing their development, and reducing their prospects to those of satellite teams. For Lowes, somehow promoted from Moto2 despite world-class inconsistency, there will be a lot of badly scuffed leathers. Espargaro seems to be getting the hang of things more quickly. For Fausto Gresini, for whom the allure of the premier class is almost irresistible, 2017 will be like shooting 108 on the golf course—enough good shots to keep you coming back, but a vast majority of poor to terrible swings. Two unfamiliar riders. A not-quite-competitive bike. Bring a book. Going into 2017, the factory Ducati team is the most interesting group on the lot. The Italians expect plenty, and soon, from their brand new triple world champion. Jorge Lorenzo, in turn, suggested that the first real day of testing at Sepang was a bit terrifying, but with the help of Stoner and Michele Pirro is adapting to the GP17. No more getting blitzed in the straights, but he needs to re-learn cornering if he is to avoid “pulling a Rossi,” which seems unlikely, unless he finds himself unable to keep the bike upright. A win in Qatar would do a lot to build his confidence, although the same could be said for every rider on the grid. Nice writing. Consistent Andrea Dovizioso has been flying under the radar during the offseason, allowing the cameras to focus on Lorenzo while he plots his strategy to win the title himself. The latest iteration of the Desmosedici will probably be a great bike, and Dovi has four years in with the factory. Personally, I would love to see him fighting for a title with Vinales and Marquez. It could happen. I think the odds favor him to finish ahead of Lorenzo this season. For me, the most interesting question is whether the big red bikes are to be housed in Lorenzo’s Land or Gigi’s Garage. My personal favorite rider. To disparage, mock, call out and, ultimately, have to eat crow over. Crashlow won his first two premier class races in 2016, after years of making excuses and broadcasting blame for not having won earlier. He has burned bridges with Yamaha and Ducati, although he seems to be a fair-haired child for Honda as of late. Complaining a month ago that “Honda are on it’s back foot,” or some other foolish British verb conjugation, it seems the litany has resumed. With Vinales added to the mix at the top, I don’t expect Cal to win two races again this season. The struggling #3 Honda team, at the end of the Sepang test in January, had neither rider fit to ride. Tito Rabat was a great rider in Moto2 but is proving to be a bust in MotoGP. Miller, tagged by HRC for greatness at a young age, is proving to be unable to keep the RC213V upright, piling up more serious injuries than The Black Night in the Monty Python classic, not to mention creating acres of shredded, brightly painted fiberglass. This team could be out of existence in a year or two, providing an opportunity for the moon, the sun and the stars to align in such a way that, as Dani Pedrosa’s contract on the factory Honda team expires, young Miller is standing at the door, kindly showing him the way out. A national day of celebration will follow in Australia, one in which Livio Suppo, team boss at Repsol Honda, having been out-voted by marketing folks seeking an Australian Alien, may not be participating. Hmmm. Two freshmen on the satellite Yamaha team. Herve Poncharal, team boss, has a thing for Folger; perhaps he likes the cut of his jib, but I haven’t seen much in the way of dominating performances in Moto2 to justify a promotion. Zarco arrived on the strength of having become the only rider in Moto2 to title twice, consecutively, and is probably disappointed at not having a factory bike of some kind at his disposal. Both riders will be on steep learning curves this year, although Zarco faired surprisingly well at the Malaysia test. He and Alex Rins figure to battle it out for rookie of the year honors. Lin Jarvis’ factory Yamaha team enters the season with GOAT candidate Valentino Rossi and the heir apparent, the aptly-named Maverick Vinales, recently graduated from a two-year riding academy with the factory Suzuki team. During those two years, he figured out how to win (Silverstone 2016) on a relatively slow bike. Now that he has earned arguably the fastest complete bike on the grid, great expectations abound. His “win” at the Sepang test in January affirms those who expect him to title in his first Yamaha season. Marc Marquez, reigning and triple world champion, has been encouraging this thinking, talking publicly about how concerned he is with Vinales. Intentionally adding to the pressure, getting inside Vinales’ head. Rossi-like. Rossi maintains his Alien status, but it will be tested again this year. (Dani Pedrosa is now an Alien Emeritus.) He still has the passion and the conditioning and the experience. But does he have the reflexes and balance he did when he was 28? I think not. I think he is also less of a risk taker now than he was a decade ago. He will undoubtedly win some races this year, but may lose the season contest with his teammate, effectively ending their friendship for all time. The intra-team competition could tighten significantly, however, if Vinales finds himself cartwheeling through a lot of gravel traps this spring. The #2 Ducati team. Danilo Petrucci, the burly ex-cop, may find himself in the mix once in a while (probably in the rain) this season onboard the GP17 he won fair and square in the intra-team competition with Scott Redding last year. Redding, sadly, will not be in the mix on his GP16, as he seems unable to get over the hump in the premier class after a glittering (?) run in Moto2. With three name sponsors, it seems likely the team will have plenty of frames and fairings to replace for Redding as he goes bumping around the tracks of the world, muttering about how it just isn’t fair. A satellite Ducati team with upset potential. Alvaro Bautista, like Barbera, has been a consistent underachiever in the premier class. His own high water mark occurred in 2008, when he finished second in the 250cc class behind a guy named Simoncelli. In 2012 and 2013 he flogged Fausto Gresini’s close-to-factory spec Honda to 5th and 6th place finishes, respectively. Meanwhile, enter Karel Abraham, previously employed by his dad before serving a one year sentence in WSB last year. He’s back, for whatever reason, this time on a GP15. Bautista has, over the years, shown moments of great skill and moments of sheer stupidity. This year, again mimicking Barbera, he has a chance to peek at a podium or two after two grinding years with Aprilia. This may also be the best bike HE has ever ridden, although the Honda back in 2012-2013 was badass. We will stick our necks out here and predict zero podiums for the Aspar team in 2017. Another second-string Ducati team that could surprise, 2017 features Barbera on a GP16 and Baz on a GP15. Hectic Hector’s career saw its high-water mark in the 250cc class in 2009 when he finished second to Hiro Aoyama. Once he arrived in MotoGP, never having been the beneficiary of first class equipment, his career has leveled off. He has battled slow bikes, injury, and a low racing IQ to a series of undistinguished finishes. Last year he showed some improvement which, if it continues this year, could actually make him a consistent top ten finisher. Meanwhile, young Frenchman Loris Baz, who is, like, 6’3” tall, had an up and down second MotoGP season. Three distinct episodes of “start slowly, improve, then crash” marked his year, including a fourth-place finish at Brno and a fifth at Sepang. Riding a Ducati at 6’3” suggest you’re going to prefer the long flowing circuits over the tight squinchy ones. He will need to learn to keep the bike upright if he is to continue in MotoGP. Oh, and I checked—the French name Loris translates in English as “Loris.” The only other Loris I ever knew was a girl. Teammates on the Tech 3 Yamaha for the past two seasons, these two get factory rides with the rookie KTM factory team. The Austrians have enjoyed decades of success elsewhere and feel it is but a matter of time before they start winning in MotoGP. Years, perhaps many, in my opinion, but what do I know? Of the two riders, I prefer Espargaro, a year younger, with a title under his belt in Moto2. Smith seems like a nice guy, but appears snake bit. It’s always something with Bradley–an injury, a mechanical issue, a head cold. Whatever. I will gladly back Espargaro this year in the intra-team rivalry, the only competition that will mean much of anything to this group. The factory rollout of the KTM entries in all three classes included words from the Chief Cheddar at KTM Itself, Stefan Pierer, announcing his intention to fight with Honda for a MotoGP world championship in the not-too-distant future. Along with the factory Yamaha and Ducati teams, HRC is royalty in the world of grand prix motorcycle racing. Repsol Hondas have been ridden by world champions Mick Doohan, Àlex Crivillé, Valentino Rossi, Nicky Hayden, Casey Stoner and Marc Marquez. Its prospects are decidedly mixed heading into 2017. With several new engines to figure out, the Sepang test was a bit of a struggle, with Marquez working hard to finish second behind Vinales, but able to deliver several impressive 20-lap race simulations. Appears to be another year in which Marquez will have to manage an inferior bike to battle for the title with the other Aliens. He did it last year. I believe Vinales will collect a number of wins and an equal number of DNFs, allowing a mature Marquez to slug it out with Jorge, Dovi and Vale again this year. With two new riders, Suzuki Ecstar will not threaten. Iannone? Dovizioso? I think not. As for Dani Pedrosa, I look for him to finish seventh or eighth this season, as he has clearly lost a step since his prime in 2012. Whether he’s interested in serving as Marquez’ wingman in 2017 is problematic. If he slips out of the top ten Honda may buy out his last year and bring Miller or, more likely, Crutchlow onto the factory team in 2018. Miller may blossom this year. Probably not. The second most interesting team on the grid, a rapidly improving Suzuki will have two new riders in 2017. Andrea Iannone worked himself out of a job on the factory Ducati last season and landed with Suzuki, which may be a piece of good luck for both parties. Thus far in his premier class career, Iannone has been unable to harness his impossible speed, his temperament and aggressiveness often getting the better of him. It would be loads of fun to see him battle with the front group this season, and it could happen. Unless The Maniac is still, well, a maniac. Alex Rins has had Alien written all over him since he was about 15. Although he never titled in the lower MotoGP classes, he recorded two seconds and two thirds in three Moto3 and two Moto2 seasons. The Rins and Marquez families do not exchange Christmas cards, setting up a new rivalry for the next few years while Rins earns his whiskers. He figures to become a problem for both Marquez and Vinales in that time. Definite Alien potential here. I see a couple of podiums in store for Suzuki in 2017, perhaps a handful. Unless the bike is greatly improved they may not compete for a win, but the Suzuki program seems to be progressing nicely. Perhaps 2018 will be their year. Three productive days of testing at Phillip Island in early February taught us little we did not already know. Marquez and Vinales seem to be running in a league of their own. Dani Pedrosa still has some juice left in the tank. And rookie Jonas Folger can coax at least one fast lap per day out of his Tech 3 Yamaha. 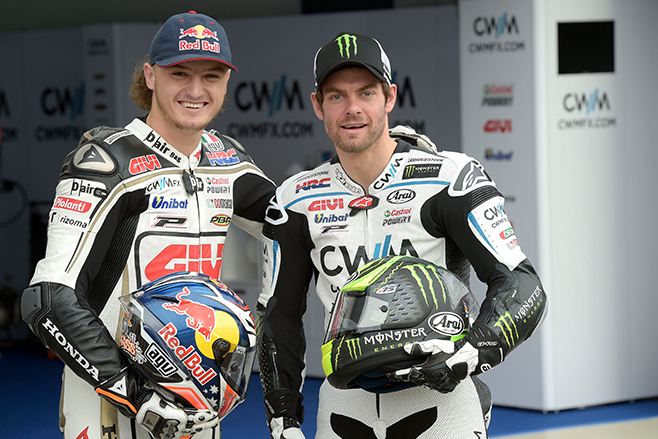 Cal Crutchlow and rookie Alex Rins ran almost identical fast laps on Friday. Dovizioso and Lorenzo were running neck and neck for seventh and eighth places, respectively. Jack Miller, Aleix Espargaro and Alvaro Bautista finished ahead of Valentino Rossi, something you don’t get to report every day. And lots of disappointed Ducati riders (six of the bottom nine) muttering to themselves farther back in the dust. Not a great three days for Ducati Corse. The second Grand Prix de la República Argentina of the modern era started out as a parade and ended with everyone—riders, fans, announcers—gasping for air, going mad over the events on Lap 24. Defending world champion and Honda poster boy Marc Marquez would have, could have and should have won this race. But two errors on his part, combined with one of Valentino Rossi’s finest hours, spelled disaster for the young Catalan, who now sits squarely behind the eight ball heading to Jerez. Results of the practice sessions on Friday looked as though Carmelo Ezpeleta had drawn the names out of a hat. FP1 included Suzuki #1 Aleix Espargaro 1st, Pramac Racing homeboy (sort of) Yonny Hernandez 4th, Avintia Racing’s hapless Mike di Meglio 8th, and Marquez 10th, sandwiched between non-contenders Alvaro Bautista and Jack Miller. The factory Yamaha contingent featured Rossi in 14th and Jorge Lorenzo 20th. FP2 was closer to form, ignoring Rossi loitering in 9th place. By Saturday afternoon, things were mostly squared away. Marquez qualified on pole, with my boy Aleix 2nd (Suzuki’s first front row qualifying run since Loris Capirossi at Mugello in 2009) and factory Ducati #2 Andrea Iannone edging CWM LCR Honda hothead Cal Crutchlow for 3rd place. Lorenzo could manage only 5th place, while Rossi would qualify 8th; more about that later. At the start, Marquez jumped out to the early lead, which grew to over four seconds midway through the race. Crutchlow, feeling his oats in his first visit to Rio Hondo, led the trailing group, followed by the two factory Ducatis and the factory Yamahas. Rossi went through on Lorenzo on Lap 6. Moments later, Pramac’s Hernandez was on fire, literally, the Colombian’s bike spewing flames until Yonny, suddenly aware that he was “doing a Zarco”, pulled off-track and ran away before the inevitable explosion, which failed to materialize as the marshals assailed the inferno with half a dozen fire extinguishers. Anyone in the market for a used Ducati? By Lap 9, Lorenzo had fallen off the pace, his 2015 season starting to resemble the debacle he experienced during the first half of 2014. In quick succession, Rossi, his fuel load having dropped, went through on Iannone in Lap 9, spanked Crutchlow on Lap 10, and disposed of Dovizioso on Lap 11, emerging in second place, over four seconds behind Marquez. It was at about that time that many of us, presumably including Marquez, realized the first of his two mistakes today: he had abandoned the extra hard rear tire for the softer option after the first sighting lap. Rossi had stuck with his original choice of the harder option, a decision which would prove crucial as the race progressed. Things came together, in more ways than one, on Lap 24. Rossi appeared rock solid, breathing down Marquez’s neck. Marquez’s rear tire appeared made of Crisco, as he was sliding all over the place, both tires adrift in the corners. The riders exchanged places twice, leaving Rossi in the lead by a nose. In the middle of turn five the two touched, to no one’s surprise, Marquez dropping back ever so slightly. But at the exit of turn five, they came together again hard, Rossi in front and on the line, the front of Marquez’ Honda folding up, leading to a fast lowside, bike and rider sliding 50 yards into the grass. Race Direction looked at the incident for a full 20 seconds before declaring no foul. End of story. Marquez’ second mistake? Realizing that Rossi had the pace, and being too stubborn, too willful to allow him through and settle for second place and the 20 points that would have accompanied it. Yes, he has the heart of a champion, and two world titles to show for it. Yes, his lizard brain was fully in charge at that moment. But he needs to understand that he cannot win every race, even those that appear to be his for the taking. Instead, he now trails the fully rejuvenated Rossi by 30 points. Hell, he even trails the toasted Jorge Lorenzo, not to mention both factory Ducatis. He has put himself in a bad place, with no one to blame but himself. As promised, here’s a quick question for Rossi fans. What do today’s race, the 2015 season opener at Qatar and Phillip Island 2014 all have in common? In all three, Rossi qualified 8th and won the race. For Vale, his career has reached the point where his starting position on the grid is essentially irrelevant. With the right tires and the right setup, one thinks he can win from anywhere on the grid. At age 36, he may be as strong as he’s ever been. He has surpassed Lorenzo as the #1 rider on the Yamaha team, and he may eclipse Marquez as the 2015 world champion. Dude is tougher than a two dollar steak. The Espargaro brothers had an interesting day. Aleix, on the factory Suzuki, started from the middle of the first row. Pol, on the Tech 3 Yamaha, started from the outside of row six. Aleix managed to finish 7th, three seconds in front of his brother in 8th. The CWM LCR Honda team enjoyed a successful day, with Crutchlow’s prototype pipping Iannone at the flag for third place, while Jack Miller, on the production version, finished 13th to take the top open classification award for the day, what I like to think of as the Taller Than Danny DeVito Award. What I can’t figure out is why Cal always seems to be pissed at someone. He can pretty much be counted upon to complain about something or someone at every single round. Yesterday, he was honked at Jorge Lorenzo (a double premier class world champion) and/or Maverick Vinales for preventing him from qualifying on the pole. As if. Today, given Marquez’ ill fortune, he lucks into the last step on the podium on a day he would normally finish fifth. During the obligatory post-race interview with Dylan Gray, he goes all ungracious, thanking “all the people that wrote me off” for the win. For a guy who makes millions of dollars doing something he loves to do, he has a very unbecoming supersized chip on his shoulder. Today’s majestic, awe-inspiring triumph rocketed him up from 7th place coming into the weekend all the way up to 6th. I, for one, am blown away. From where I sit, Crutchlow ran a good race. On a factory spec Honda, he should. Among other things, Marc Marquez needs some home cooking. He’ll get it in two weeks at Jerez, where he will need to dispose of Jorge Lorenzo and Andrea Iannone, put himself in third place for the season, and start chipping away at Dovizioso and Rossi. Last year he dealt with the pressure of reeling off 10 consecutive wins to start the season. This year, he has a different kind of pressure to deal with. This year we’ll see what he’s made of. Two years from today. Video courtesy of MotoGP.com.